You are currently browsing the category archive for the ‘NASA Space Center’ category. In those days of anticipation, I was just a boy. Yet, it was easy to get caught up in the NASA exploration of the stars, a sensational exclamation point of God’s mighty hand of creation. Their adventures captured the imagination of every American and the citizens of the world. Putting a man in space challenged the comic cartoon dreams of being Flash Gordon. Describing the thrill and national pride of the stars and stripes on the sleeve of a space suit and following every bit of progress on nightly television news was a part of history that I lived. Now, I could reminisce even further during my stroll through NASA’s space center. In the dark exhibit of NASA’s march into space it would be easy to overlook the overhead displays. Everything on ground level was so fascinating. Your brain is left spinning with the historical notes, the audio recollection of astronauts and the life-size displays of real space capsules, rovers, space suits and space stations. Yet, overhead, hanging from the star-studded ceiling is a Gemini space capsule. The door is open to let the light add to the display. 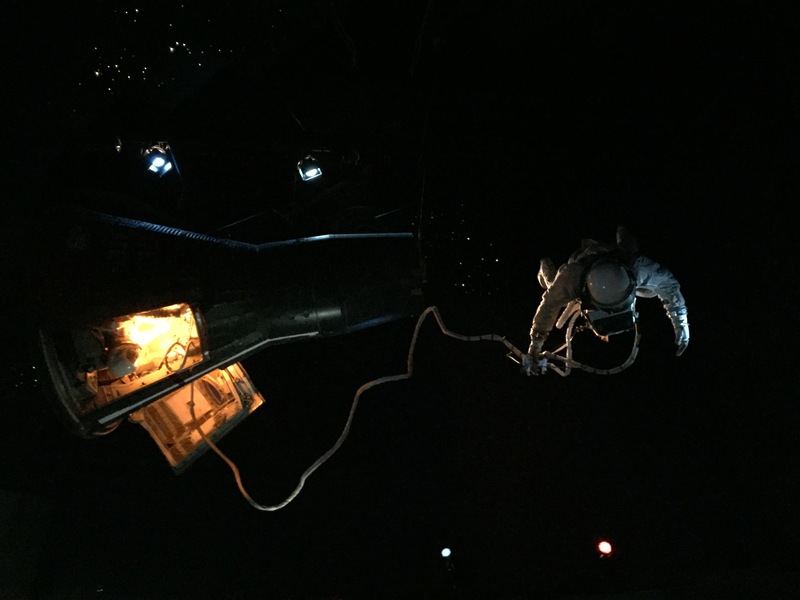 There on a long tether is a tribute to one of the great benchmarks of space exploration. An astronaut was out for a space walk. In my youth when this historic exercise was about to occur, we all doubted that it could be real. Our life in comic books said it was true but the human imagination has no limits but science makes us think twice. Yet, right in that historic moment we all marveled. We were glued to our television sets. Our minds were memorizing the moments, listening intently to the commentators, trying to sense what it was like to walk in space. Now, to be in the NASA Space Visitor’s center and to stand in that exhibit was deeply stirring. The life-sized components including the capsule, space suit and tether makes the adventuresome spirit of any American swell with pride. America did it!